Because of its eye-catching shiny tone, sterling silver is a popular material for engagement rings. In comparison with several other materials used to craft engagement bands, sterling silver is more cost effective and often weighs less. Men who want to give their special woman a large diamond but are on a budget should consider a sterling silver band instead of the popular expensive materials. Often by purchasing a sterling silver band, a considerable enough amount of money will be saved so that he may also choose a larger diamond. Men should have a general idea about what their fiancée-to-be’s preferences are. Some women may prefer a different stone than a diamond, or perhaps a diamond with small colored stones consisting of her children’s birthstones surrounding it. Some women do not voice their opinions about jewelry and asking just might give away the surprise, so in these cases it is best to ask the woman’s friends or family members who are capable of keeping a secret. Women usually always talk to their family or friends about what style of jewelry and rings they prefer. If a man is unable to obtain any information from these sources, he should pay attention to what kind of jewelry his girlfriend wears and try to make a judgment based on that. However it is usually always safe to buy a woman a sterling silver single solitaire 1-carat diamond ring; it is not too large and not too small, but simple and timeless. While asking the woman’s friends or family about jewelry preferences, men should also ask about her ring size. Often times friends will know because they have probably gone shopping with her. Parents may also know if they have bought her a ring in the past for a gift. Sometimes friends and family may not know this information for sure; if they seem to guess and are not sure, it is best to try to obtain the measurements manually. Borrowing one of the woman’s rings and measuring it with string is one way, another would be simply to borrow it and take it to a jewelry store to compare sizing with a ring model, then quickly return it to her jewelry box. It is important to know the exact ring size for the best fit. In a worst-case scenario if none of these options work, it is best to purchase a simple sterling silver band for the ring that seems just slightly larger than her finger. Simple bands may be sized down, but sizing them larger is not a task taken on by many jewelers and may wind up costing a small fortune if the ring has a gemstone setting. Sterling silver is one of the most beautiful substances used to make engagement bands, however it is also one of the most risky purchases to make without knowledge of skin allergies. Sterling silver is one of the most common substances known to irritate already sensitive skin. Not all women have skin allergies or sensitivities, but those who do will usually always wear gold or stainless surgical steel jewelry. Men should resolve this question by asking a woman if she has ever bought sterling silver jewelry to wear. To avoid sounding suspicious, the question may be first diverted by talking about something unrelated; for example, previous vacations. The man should steer the conversation toward souvenirs and ask his girlfriend if she has bought any sterling silver souvenir jewelry on vacation and if she still wears it. If a vague answer is given, he should mention informatively that some people have an allergic reaction to it; if the woman has ever had a reaction to silver, this should spark a story about it. Finding out this information is important to avoid spending money on a ring that may have to be returned. Jewelry storefronts may appear enticing, often displaying the most attractive pictures of eye-catching jewelry. While it is commonly known that the highest quality jewelry is purchased from these stores, it is important for those on a budget to remember that the same quality may be found at wholesale stores and outlets. Jewelry stores buy the exact same pieces from these stores, but unlike the outlet the jewelry store will mark up their engagement rings at least 100% and sometimes upwards of 300%. Salespeople will entice men shopping for an engagement ring with phenomenal bargains of 50% off. This deal may sound good, but the man could actually go to a wholesale store and still pay less for the same ring. Men seeking a special designer ring should avoid wholesale stores, as they do no sell famous designers’ pieces. The internet is another popular place to purchase sterling silver engagement rings. Sometimes even those who plan to shop in a jewelry or wholesale store should utilize the internet before beginning. By browsing jewelry stores online, a man will enjoy seeing the many engagement ring options in the comfort of his home, without any salespeople trying to push him to the case of the largest and most expensive rings. It is best to purchase rings from internet stores based only in the United States. Unfortunately many foreign jewelry dealers are not required to uphold the same standards of quality and fraudulent advertising as those in the United States. Many people have purchased rings from foreign dealers that are fake and have been unable to recover any compensation. While most rings sold in stores will specify that the ring is pure or finished, some may not. This is one major risk of purchasing a ring, especially inexpensive ones from internet companies that are not well-known and reputable. Rings with a sterling silver plating or finish will not be suitable for a jewelry piece that is meant to last forever. Usually a pure sterling silver ring will actually weigh considerably less than a plated ring. 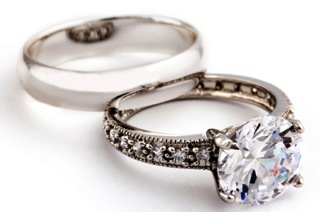 Most reputable jewelers will not only give a receipt of purchase and oral guarantee, but also a written warranty or certificate of authenticity with a sterling silver engagement ring. If the ring includes a gemstone, the warranty terms will usually require the customer to have the ring regularly checked and signed for by an approved jeweler. It is also important to keep in mind that sterling silver may tarnish; tarnish spots are surface blemishes but do not indicate a fake ring. Prolonged exposure to some chemicals or acids, such as lemon juice may make the ring tarnish. Spots of tarnish are easily shined away by polishing the ring with a special polish or even toothpaste and a toothbrush. Most jewelers will clean a sterling silver ring for free, removing any tarnish and shining gemstones to a brand-new sparkle. Sometimes a man may find a deal for an unused sterling silver engagement ring outside of a store, perhaps at an auction or private sale. While this type of transaction is risky, it is best to avoid spending a lot of money as a general rule. People do sell high quality jewelry for less than resale value, so a good deal may be possible to find. Before purchasing any ring in a private sale, the customer should always check for markings on the inside of the band. Pure sterling silver rings will be marked with the numbers “925” or “.925”. Additionally a set of initials or insignia may be present to indicate the manufacturer or crafter’s mark. The ring should feel lighter than a regular metal ring of the same size. The ring should be checked thoroughly for signs of chipping or discolored wear other than tarnish, which indicates a plated ring. To be safe, a man purchasing a second-hand sterling silver engagement ring should request the owner sign a certificate of authenticity or a simple sales contract, guaranteeing that all materials are genuine. As mentioned, pure sterling silver jewelry will weigh less than nearly every other type of metal used in fashion and fine rings. Depending on the market, sterling silver averages between $15 and $19 per ounce. Jewelers selling a ring that may seem overpriced should be able to verify the actual weight of the band so the customer can confirm a fair price for the silver band according to weight. Keeping in mind that retail jewelry stores will charge more than wholesalers, customers should expect to pay more than market value at a jewelry store. Additionally, a band which includes intricate designs, inlaid diamonds or details will cost more due to the labor involved in crafting it. Before purchasing a ring, men should become familiar with the pricing of diamonds and the features that determine that price, such as clarity, color, cut and carat. Remembering all these tips will assist men in finding the perfect sterling silver engagement ring.